Edition: From the deluxe edition of 70 on japon impérial edited by Vollard; there was also an unsigned edition of 340 on Rives wove and an edition of 99 on Van Gelder wove signed in a light brown pigment. In 1931, Picasso created a series of book illustrations for a deluxe edition of Balzac’s short story, Le Chef d’Oeuvre Inconnu (The Unknown Masterpiece). Balzac had spun a story of a 17th century artist, the master-painter Frenhofer, who was driven mad in the endless pursuit of perfection while painting the portrait of his model. After he had sequestered himself for ten years in this Pygmalion effort, his friends discovered him along with his masterpiece. The canvas revealed that he had reduced his model to an incomprehensible abstraction. Given that his painting predated abstract expressionism by some three centuries, Frenhofer, misunderstood by his friends, destroyed the painting and died that very night in shame. Although few of Picasso’s illustrations relate directly to the story, the etching at hand is the “money shot”. 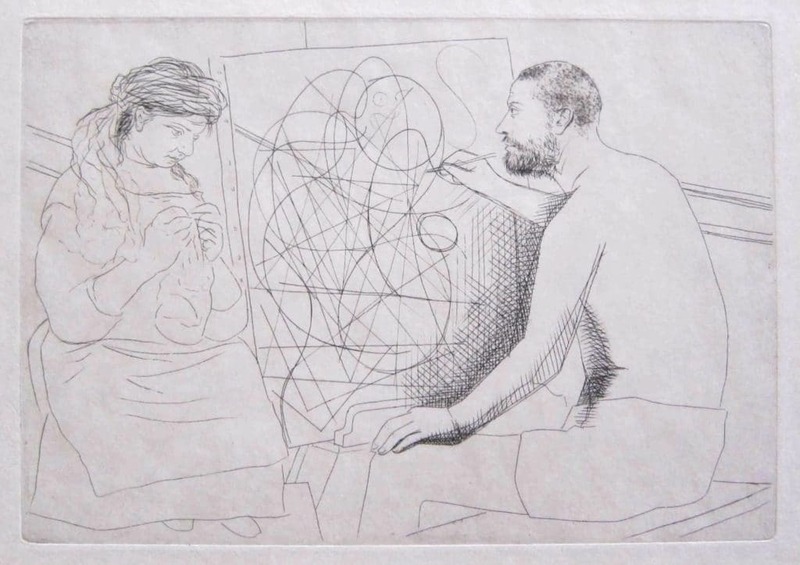 It depicts the story’s central, domestic scene, with the artist toiling away on the abstract “portrait”, while his model passes the time with her knitting. So, you autograph hounds may be wondering, why snap up this impression when there are even more signed impressions to be found? Here are two reasons why: The signatures are all quite faint, having a light brown hue. The descriptions of these impressions that I have read state that these signatures are faded, but I have seen many impressions of these 12 etchings and have never seen an “unfaded” one. 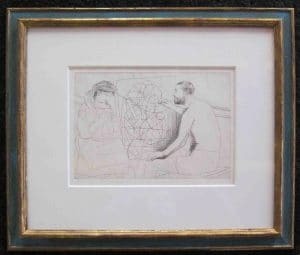 My friend and colleague, Emanuel Silberstein, has it on the best authority, Picasso’s printer, that the unusual pigment with which Picasso signed the edition was stop-out, a solution used in the process of creating aquatints. The second reason is that japon (aka japan) paper takes up the ink better than other papers. Therefore, one can expect a richer impression with more plate tone in this deluxe printing than in the remainder of the edition.